The Brick are helped by Latics to Pack Christmas Hampers	"
Will Grigg, Dan Burn and Michael Jacobs visited Wigan Athletic Community Trust’s Montrose Skills Hub to help pack Christmas hampers for families across Wigan as part of the club’s ongoing support for The Brick, its charity of the season. The Brick help people across Wigan Borough who are homeless, in poverty or facing debt crisis held a Christmas donation drive at Montrose Skills Hub throughout the week before Christmas, with staff and volunteers from the charity supporting 150 families ahead of the festivities. 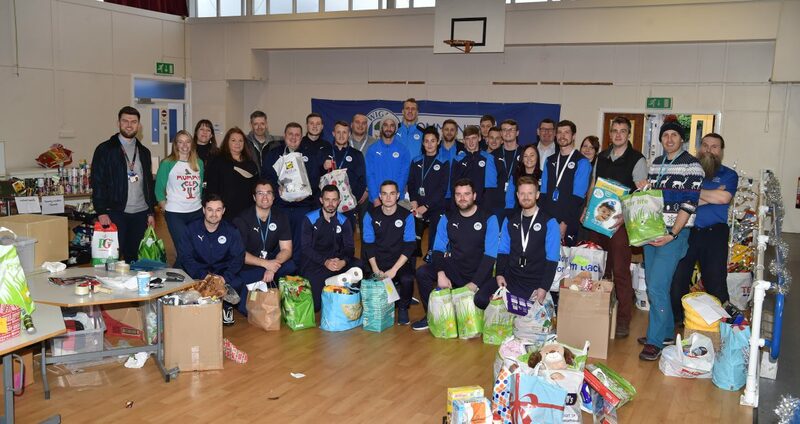 Will Grigg said: “Coming along to support The Brick’s donation drive was the least we could do because it’s really special to know that we’ll have played a small part in putting a smile on someone’s face on Christmas day. Alice Coren, Re-Use and Re-Cycle coordinator for The Brick, said: “The donation drive is something The Brick have done for several years now and we do it because we want to give a little Christmas cheer to families who otherwise wouldn’t have anything to open on Christmas day. The aim of the partnership between The Brick and Wigan Athletic is to raise £100,000 to buy The Brick Works facility, which is a centre that offers training to increase the employment opportunities for unemployed people.